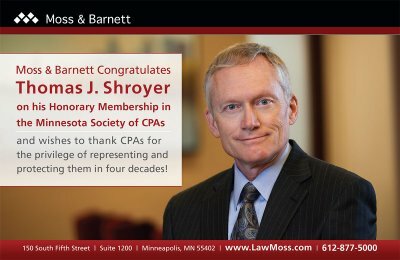 Moss & Barnett is pleased to announce that Thomas J. Shroyer was awarded an Honorary Membership by the Minnesota Society of Certified Public Accountants (MNCPA) at its 2017 Celebrate CPAs Awards Luncheon held on September 28, 2017. 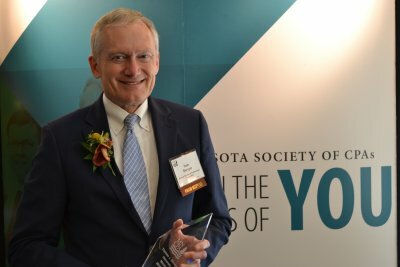 Only four other individuals have been granted Honorary Membership in the Society for their dedication and contributions to the MNCPA and the CPA profession, without being a licensed CPA. Tom has served as Moss & Barnett's Chief Executive Officer since 2000 and chairs Moss & Barnett’s nationally acclaimed accountant law team. He represents several national, super-regional, and regional accounting firms, national corporations, businesses in the Midwest, and professionals. Tom defends CPA firms of all sizes on malpractice claims in federal and state courts throughout the United States, while also advising them on loss prevention, risk management, mergers and acquisitions, partnership and operating agreements, and employment matters. He has twice been selected as a Best Lawyers “Lawyer of the Year” in Minneapolis for Professional Malpractice Law – Defendants, and has repeatedly been listed in Best Lawyers and Super Lawyers. Additionally, Tom has written extensively on the topic of CPA professional liability (including the treatise, Accountant Liability) and is a frequent speaker at professional seminars. The MNCPA serves the public interest by advancing the highest standards of ethics and practice within the CPA profession. MNCPA delivers on that promise by offering extensive continuing professional education and resources; advocating for members and the public with regulatory agencies and boards; and mentoring and encouraging the CPAs and business leaders of tomorrow. Founded in 1904, the MNCPA has more than 9,000 members who work in public accounting, business, industry, government, and education.